“I’m actually the Principal at Heck….. L. Thomas Heck Middle School to be exact! The school, which will open for the 2009-2010 school year, was named after our recently retired superintendent, Dr. Heck. The school is located just outside of Phoenix, AZ in Litchfield Park Arizona. We all were very excited and have had a lot of fun with the release of this book, and it’s premise. While the staff isn’t as ‘colorful’ as the one in the book, they do share the same desire to teach what they know. Hopefully there will be more ‘happenings’ from Heck to share with my staff and students at Heck. L. Thomas Heck Middle School will occupy 20 acres and house 750 students in sixth through eighth grades. Tom Heck, who was superintendent for almost two decades until he retired in 2007, said it is an “incredible honor” to have the school named after him. He said he has high hopes for the middle school. “It’s the Litchfield way to include the community so that parents and kids feel like it’s theirs,” Heck said. Heck handpicked Kevin Sotomayor, principal at Palm Valley Elementary, to be the new school’s principal. Sotomayor said he wants parent and student involvement. “My philosophy as an administrator is to have an open-door policy and take in everyone’s opinions,” he said. Principal Bubb wants parent and student disembowelment. “My philosophy as a badministrator is to have an open-door policy…there’s the door…now why don’t you run along before I sic Cerberus on you? I’d love to take in your opinion, but I don’t take in the deluded ramblings of lobotomized monkeys,” she said. Sotomayor is energetic, has a great sense of humor and is dedicated to bringing high academic standards to Heck. Bubb, on the other claw, is bitter, sarcastic, and dedicated to bringing high-caloric hamsters into her gaping, fang-rimmed maw. 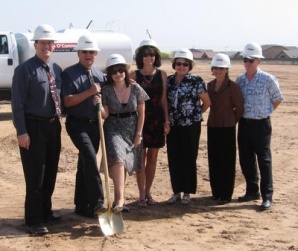 Here is a picture of various Arizonans breaking ground for the new school. Fortunately, I couldn’t upload a picture of Bea “Elsa” Bubb breaking wind in her terrible, terrible school. A Dweeb Kicked Thresh Hog! Whyville is a virtual world for teens and pre-teens, and they have a contest going where virtual people attempt to solve anagrams based on Heck. The prize? “Clams, face parts, and projectiles.” Seriously. Apparently they are a hot commodity in Whyville. Who? You! What? A contest! When? Now! Where? Whyville! I was apparently on KATU’s AM Northwest Show a couple of weeks ago. I say/write “apparently” because it was really early in the morning and I barely remember the actual experience, though it certainly appears as if I had fun. Hosts Helen Raptis and Dave Anderson made me feel very much at home, or as at home as you can feel on a set made to look like a living room, surrounded by bright lights and cameras. And no need to adjust your monitor: I was wearing my Official Heck Outfit, scientifically designed to look as if I were engulfed in flame.